A Health Care Rally on Thursday, May 4 featured speakers that represented both patients and providers at the State House in Augusta, Maine. The event promoted LD 1274, an act to promote universal health care, including dental, vision and hearing coverage. 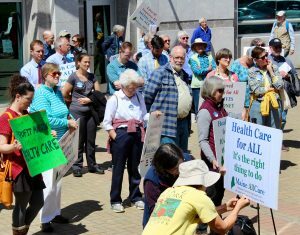 The event was sponsored by the Southern Maine Workers Center and Maine AllCare.